Recently, Google added a functionality to help content owners to show their authorship in Google Search Result. So instead of showing only the title and the excerpt of your article, your Google+ profile name and picture will also be shown in the search result. In my case, I linked my smiling picture to SODEVE’s About page. We need this widget because we want every article to be automatically linked to About page. Although in my case, the link to About page is already in the top menu. But this menu is generated by WordPress’s wp_list_pages function, so it is more complicated to add the rel=”author”. So if you don’t have this widget, please create one. 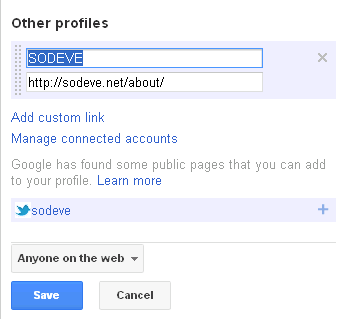 If your About page is already have link to your Google+ profile page, you need to ensure that the link has rel=”me”. Otherwise, you need to create link to your Google+ profile page. Here’s the link I am using in my About page. Now you need to link back your Google+ Profile page to your WordPress About page. Open your Google+, click Edit Profile. In Other Profile section, add a custom link to your WordPress About page. 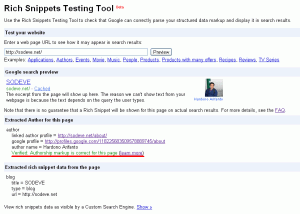 To ensure everything is working, you need to use Google’s Rich Snippets Testing Tool. Just enter any url from your WordPress site, and click Preview button. If everything OK, you should see your Google+ Profile name and picture shown. Filling up this FORM is the last and (maybe) the most important step. 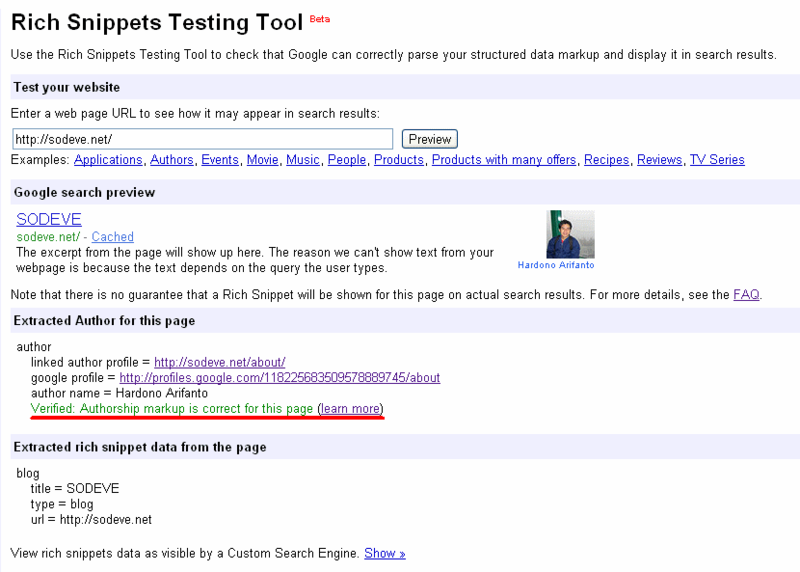 Alright, I hope this post help you claim authorship in Google’s search result. Cheers! Scott Hanselman. Thanks for the headstart. Joost de Valk. Thanks for the detailed insight.